It is way too early for this article. Only in Columbus are they about ready to jump off the Main Street Bridge and into the Scioto River due to their wretched 0-5-1 start. Montreal hasn’t been much better (1-4-1), but as a friend of mine from La Metropole told me tonight, fan reaction has been “surprisingly tame”. Winnipeg is just happy to have a team right now, so 1-4-1 officially means “just bring me another beer, eh?”. Ottawa’s a young team, and young teams usually elicit patience with just enough optimism to balance out the cynics. Almost everyone else is hovering around the mediocre mark or better so far in this young season. Notice the usage of the word almost. The San Jose Sharks are used to regular-season success: their lowest single-season point total over the last seven seasons (99) is higher than all but one New York Rangers season total over that same span. As such, one might be tempted to at least have raised eyebrows at the Sharks’ tepid 1-3 record in their first four games, especially considering three of them were at the HP Pavilion. 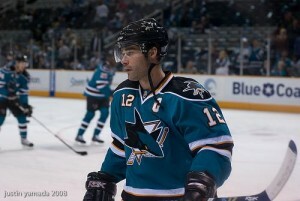 Few would question labeling Patrick Marleau as the greatest player to ever lace ’em up for the San Jose Sharks. Other great players have had stops in San Jose (Belfour, Blake, Damphousse) and still others like Joe Thornton and Owen Nolan are in the conversation, but Marleau stands above them all as a Shark. Thus, when he tallies just two assists in four games, both in the season-opening 6-3 victory over Phoenix, it’s an indicator that the offense isn’t firing on all cylinders just yet. 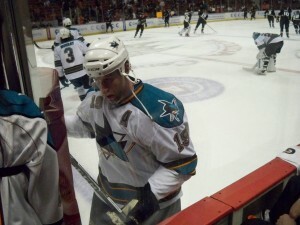 Speaking of great Sharks players. The last sentence of the previous section could be copied and pasted here, if only he had done that well. A lone assist is all he’s registered so far this season. He’s far too early into his NHL career to be talked about in the same breath as Marleau and Thornton, but Logan Couture had 32 goals and 56 points last year. One measly assist is all he’s been able to manage during the first four games of the year. Like Lindsay, it’s violating the terms of its probation. San Jose had hoped the makeover of its defense would improve last year’s 24th-ranked penalty kill (79.6%). So far, so bad: the unit has fallen to 28th in the league at 73.3%. San Jose’s defense, as with most clubs, helps to beautify its goaltending. Last year was no exception, as the Sharks gave up the eight-fewest number of shots in the NHL. 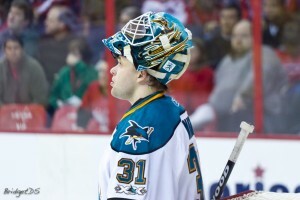 However, with Niemi on the shelf for a few games following “cyst surgery” (don’t most of us just pop those things? ), Thomas Greiss was called upon to hold down the fort — a tough thing for a semi-journeyman NHL rookie goaltender to do. He’s showing all he’s got, and what he’s got can get it done: 2G, 1A so far, logging over 22 minutes of ice time per game. Another bit of good news: he hasn’t lost a faceoff yet this season. He’ll spell the star forwards, all right, eating up over 14 minutes of ice time each game. He’s a team-high +2 and has three helpers in his first four games. He’s a perfect third-liner. Slow starts are nothing new for San Jose. Last year, they went 5-5-1 in their first eleven games, and then finished 43-20-8 the rest of the way out. In 2009-10, they started 5-4-1 and in 2007-08, 7-7-2. After shaking off the cobwebs each year, they subsequently went bananas. Even for a veteran team, building chemistry and cohesiveness is a veritable witch’s brew, particularly when three of the top seven defensemen are new to the club. It’s pretty self-evident: with a core of Thornton, Marleau, Pavelski, Boyle, Burns, Niemi and a terrific supporting cast, this is a team built to win. The slow start is merely an early bump on a long, long road. The Sharks always win during the regular season. Always.